In mid-September I took a late-summer vacation to New York, including a couple of days in Manhattan, which is always fun! 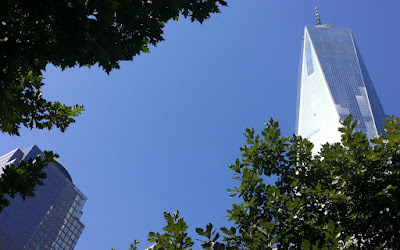 Free time in the city at last afforded me an afternoon to pay my respects at the 9/11 Memorial and to get an up-close look at the new One World Trade Center tower, the new P.A.T.H. rail station (with its fantastic Santiago Calatrava top "opening soon") and other points of interest near the banks of the Hudson River. With thanks to my friend Amy and her Mode.com team, we also enjoyed a nighttime peek at the incredible progress in the business district. 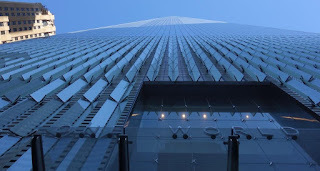 This post includes a review of One World Observatory -- Manhattan's newest attraction likely to remain a top memory for any tourist who visits it -- and some reflection on New York visits spanning 21 years. For this writer, visiting the 9/11 Memorial and new tower was not as somber as anticipated. 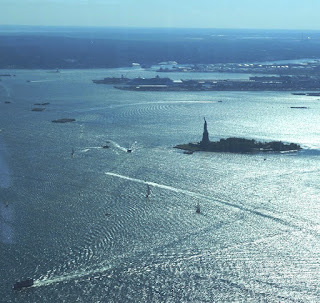 Rather, the experiences provided many moments of reflection on two decades of living since my first visit to Lower Manhattan (during college) and later as a short-term resident house-sitting for a friend who lived near the George Washington Bridge. 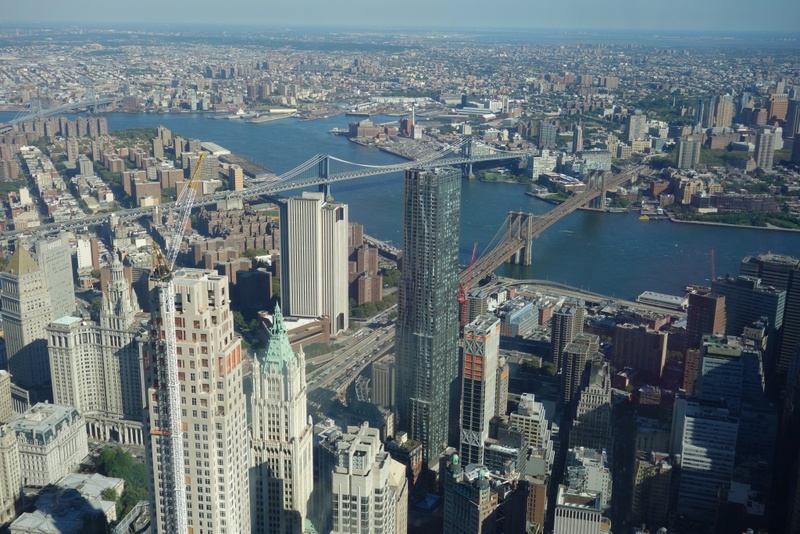 At that time, I jogged or walked the bridge a few mornings and more afternoons, often gazing south to the pair of World Trade Center towers with curiosity. During these initial New York adventures, I visited the original World Trade Center first during spring 1994, and again in October 1996 just after the New York Yankees' World Series victory parade through downtown. On the first WTC stop with my friend (then studying at New York University), we only trekked through the lobby before heading to the subway station -- it was a rainy and cold evening after visiting the Statue of Liberty and Ellis Island, so we decided ascending to Windows On The World would yield no views of the island at night. Though it was sunny on the second visit two years later, and I did take one of the World Trade Center express elevators to a half-way point (the "free" part of the tower experience, as I recall), I got cold feet about continuing to the top as I felt under-dressed in jeans and a sweatshirt worn to the parade. 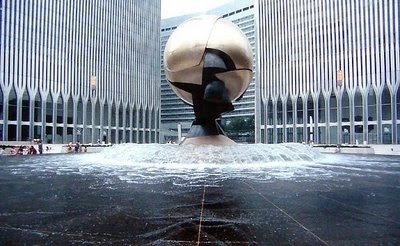 Another vague memory of the original WTC was its immense plaza with a bronze globe sculpture I learned, only years later, was"The Sphere" by Fritz Koenig. 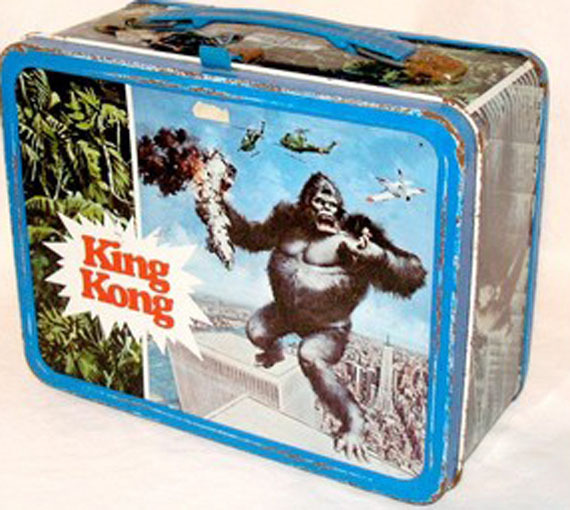 Until September 11, 2001, my only other WTC reference point was the 1978 extended-for-TV version of the film "King Kong" starring Jessica Lange and Jeff Bridges (an elementary school classmate had a "King Kong" lunchbox for which I pined many times). 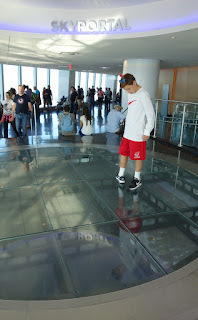 One World Observatory brought back these recollections while forging many new and spectacular memories. I highly recommend the experience. 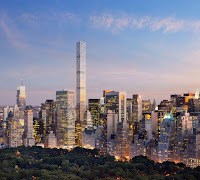 There's not much to write home about with regards to the building itself -- many other writers (and people in general, including some who work in the building) share my disdain for the milquetoast, soulless architecture and missed opportunities the tower portrays. 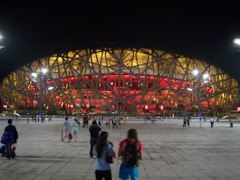 Just because it's big does not make it "great" design. 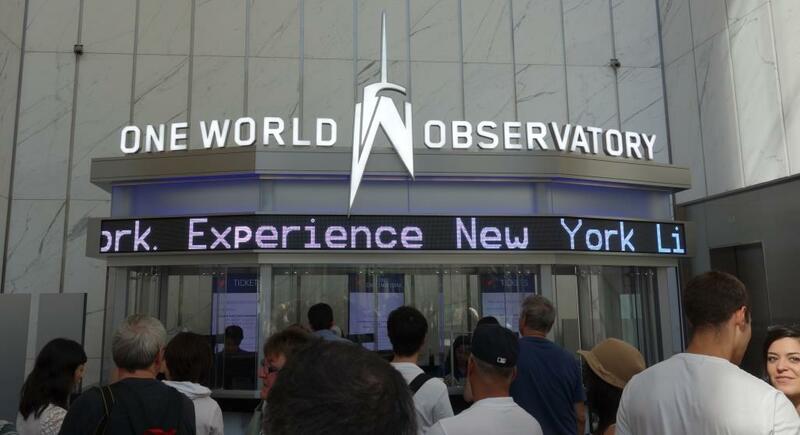 There's also not much to say about the One World Observatory queue process (lined up on the tower's west side), ticketing process (save time online in advance) nor the lower level atrium through which visitors experience a world map of visitor stats, exhibits on this site history, a faux-granite tunnel and other features designed to ease the patient wait in line for an elevator. If there's no rain, I recommend getting up close to the building and looking directly up, and also be ready to see your "spot" on the world visitor map (it cleverly pops up a few seconds after they scan your ticket). The real excitement begins by finally entering the lift cars with room for about a dozen guests and floor-to-ceiling LCD monitors on the exterior "windows." These aptly-named "Sky Pod Elevators" are reminiscent of Roald Dahl's "Great Glass Elevator" owned by Willy Wonka. 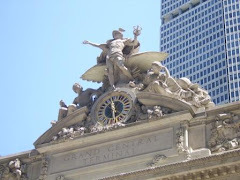 Smart visitors will have their video lenses ready as the doors close -- during the 102 level ascent of fewer than 60 seconds, passengers witness several years of Manhattan urban development (a few years per second from 1500 A.D. to present day). 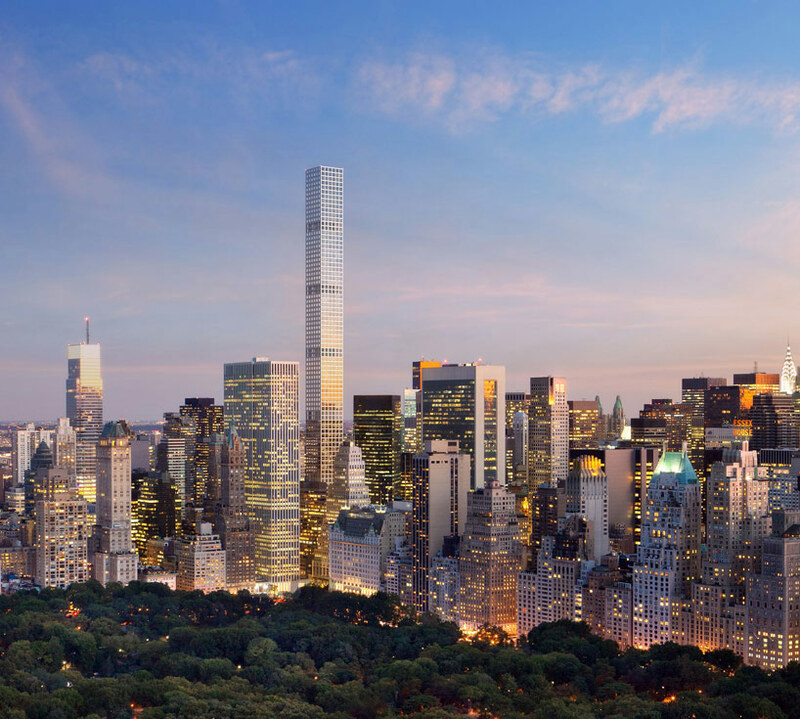 Downtown's skyline takes shape before your eyes in a spectacular manner. 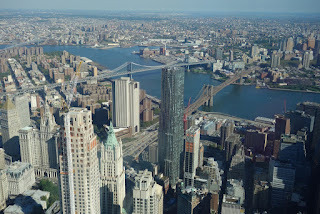 I enjoyed most the "views" of the Empire State Building and Brooklyn Bridge assembly, and requested an extra ascent just to capture it again. The Sky Pod LCD animation is on par with the outstanding train experience at Universal Studios' Wizarding World of Harry Potter. Upon exiting the elevators, visitors enter yet another dark corridor. As ears pop during another brief video presentation on a 50-foot horizontal panel, guests may be wondering "where's the view we paid to see?" 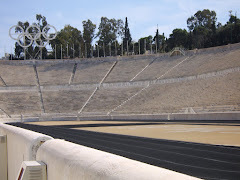 At last, the payoff in the form of ... Surprise! In a curtain-like motion the panel wall rises to unveil -- to the gleeful gasps of many -- a clear glass wall and vistas of Brooklyn, Long Island and beyond! 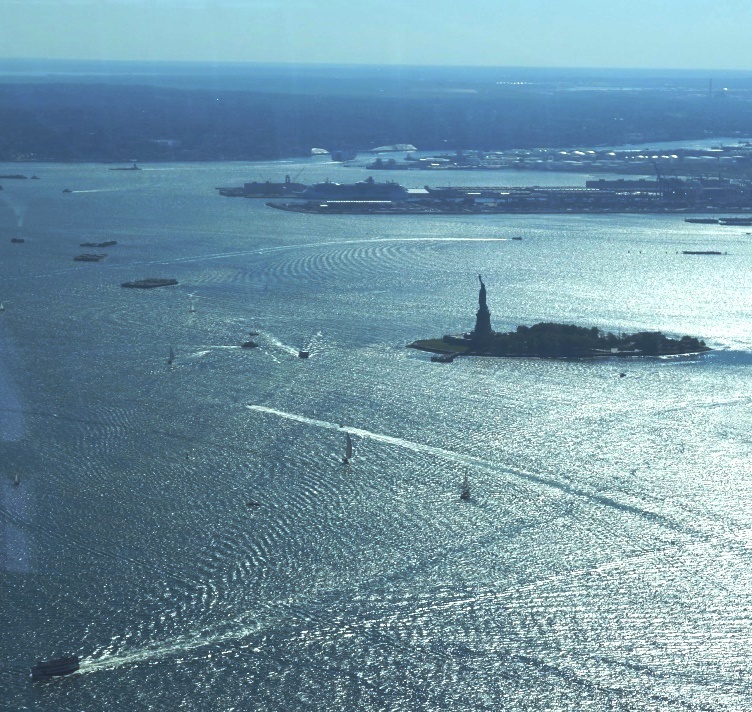 I felt lucky my visit took place on a sunny, cloudless afternoon, and spent more than an hour slowly gazing upon the Statue of Liberty, Hudson and East Rivers, the traffic on the bridges, the Lower Manhattan towers below, the 9/11 Memorial site (much further and directly below) and all of Midtown. 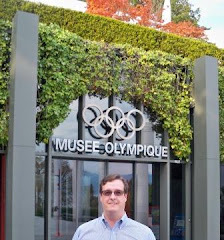 But before enjoying the limitless options to "See Forever" (the venue tag line), there was one more pause featuring demonstrations of a hand-held rental device named the One World Explorer which helps identify every landmark on the horizon with touchscreen bells and whistles. Thought I did not purchase this experience, a fellow visitor who did shared its coolness and handiness, and she seemed to be happy with her purchase. Sadly, the one building for which I sought immediate Explorer details is still under construction and not yet programmed into the device -- 432 Park Avenue, which topped out one year ago today, is the new "world's tallest residential building" (also taller than the Empire State Building) and another Manhattan sight to behold. 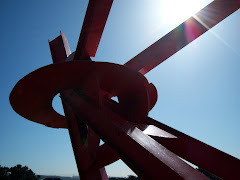 I noticed other Observatory visitors lingered for 90-plus minutes like me, soaking in every view, each passing aircraft and the earth's curves in all directions. My camera quickly filled with dozens of images. It was fun to see the 15-story yellow painting installed near Hell's Kitchen to welcome the Pope with his likeness waving to the south, clearly visible several miles away (see photo below featuring Empire State Building to play "Where's Waldo -- His Holiness Edition"). I also enjoyed looking north to the George Washington Bridge and reflecting on all the change -- for the world and yours truly -- since those autumn walks in 1996. 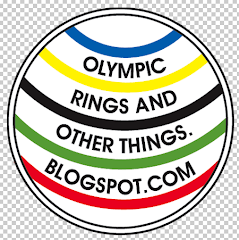 I thought of how the city might have evolved had the International Olympic Committee chosen New York over London to host the 2012 Olympics (as frustrating as it was to stand in the rain at Rockefeller Center and learn Manhattan's bid loss on 6 July 2005, they made the right choice). 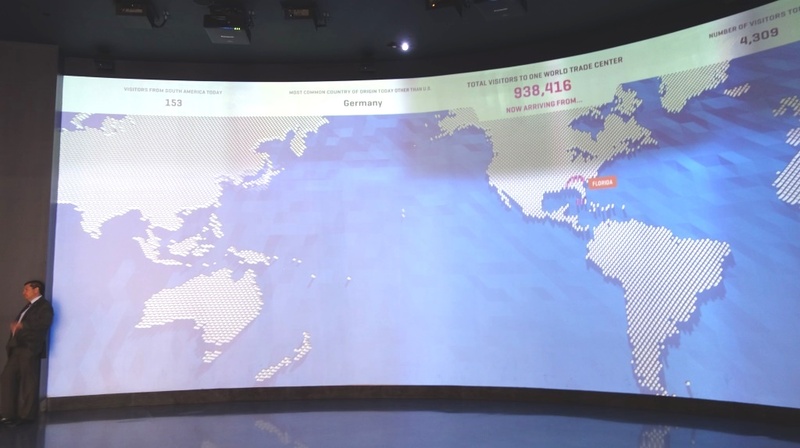 With my brain finished wandering the "Capital of the World" cityscape, I noticed the option to stand upon the "Sky Portal" featuring a 14-foot "glass floor views" (real-time video projections) of the busy streets below. 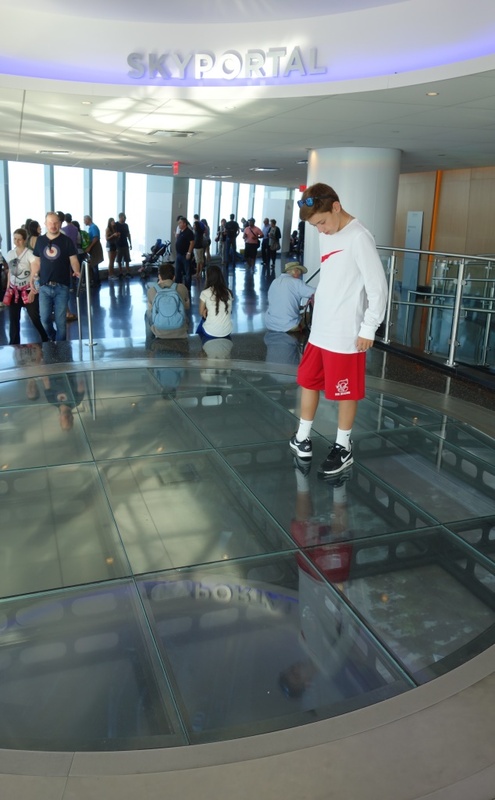 This may be a thrill for many or an "also ran" for those who previously stood upon the real glass floors of the SkyDeck hanging out the side of Chicago's Willis Tower. Noticeably absent from One World Observatory: those coin-operated binoculars and telescopes so popular at the Empire State Building. I guess the new tower's glass skin might skew the lens views, or maybe the attraction management realized no one carries spare change these days. Is the One World Observatory worth the price of admission? Yes! 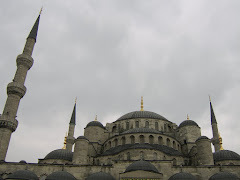 Just try to book in advance to save time in line, and wish and hope and pray for a clear day so you may see Forever. Photos by Nicholas Wolaver except lunchbox image via Ebay and The Sphere image via this great blog post.